The spinning vortex of Saturn's north polar storm resembles a deep red rose of giant proportions surrounded by green foliage in this false-color image from NASA's Cassini spacecraft. Measurements have sized the eye at a staggering 1,250 miles (2,000 kilometers) across with cloud speeds as fast as 330 miles per hour (150 meters per second). This image is among the first sunlit views of Saturn's north pole captured by Cassini's imaging cameras. When the spacecraft arrived in the Saturnian system in 2004, it was northern winter and the north pole was in darkness. Saturn's north pole was last imaged under sunlight by NASA's Voyager 2 in 1981; however, the observation geometry did not allow for detailed views of the poles. 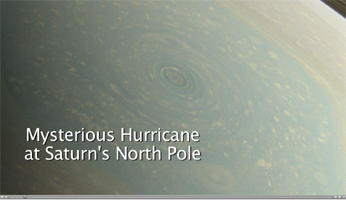 Consequently, it is not known how long this newly discovered north-polar hurricane has been active. The images were taken with the Cassini spacecraft narrow-angle camera on Nov. 27, 2012, using a combination of spectral filters sensitive to wavelengths of near-infrared light. The images filtered at 890 nanometers are projected as blue. The images filtered at 728 nanometers are projected as green, and images filtered at 752 nanometers are projected as red. In this scheme, red indicates low clouds and green indicates high ones. The view was acquired at a distance of approximately 261,000 miles (419,000 kilometers) from Saturn and at a sun-Saturn-spacecraft, or phase, angle of 94 degrees. Image scale is 1 mile (2 kilometers) per pixel. The Cassini-Huygens mission is a cooperative project of NASA, the European Space Agency and the Italian Space Agency. NASA's Jet Propulsion Laboratory, a division of the California Institute of Technology in Pasadena, manages the mission for NASA's Science Mission Directorate, Washington, D.C. The Cassini orbiter and its two onboard cameras were designed, developed and assembled at JPL. The imaging operations center is based at the Space Science Institute in Boulder, Colo.
For more information about the Cassini-Huygens mission, visit: http://www.nasa.gov/cassini and http://saturn.jpl.nasa.gov.. The Cassini imaging team homepage is at http://ciclops.org.